Vestax is a brand that reaches all corners of the scratch DJ world and indeed the wider DJ scene as well. The PDX range of turntables has been a contender for the Technics crown for some time now (and in my book easily wins but I digress) but the mixer that is iconic to most scratch heads is the PMC-07 in it's various guises. 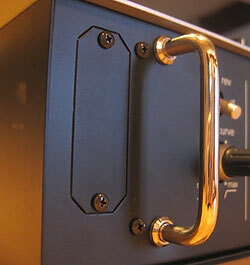 While the Rane is generally classed as the new king, nobody would ever call you crazy for buying an 07. So a couple of years ago, Vestax thought it might be a good idea to have a look at the market and bring out a potential successor to the 07 in the shape of the 007. Sadly however, Vestax seemed to have sadly misjudged what the market wanted and ended up with a bit of a lame duck that sat between DJ genres and satisfied none of them. Hurting from these wounds (especially our review), The drawing board was dusted off and a clean slate was put in place. It was time to bring the classic 07 bang up to date incorporating all the things that made it great as well as adding new bells and whistles - and fixing the things that could have been done better. The result of this hard work is the new PMC-08 Professional Mixing Controller - or 08 as it will henceforth be known in this review. Embracing the constant rampage of technological progress, Vestax have given the 08 a digital heart with an Apogee 24 bit 96k DSP. This digital technology gives Vestax a lot more scope with some of the mixer functions - the new crossfader is controlled digitally and the EQ has been expanded to allow you to get extremely flexible with the sound. They say you never get a second chance to make a first impression, but with this new 08 you get 2 chances right from the start. Gone is the 2 tone split faceplate appearance and in comes Piano Black and a somewhat risky White/Orange colour scheme - very reminiscent of the new Sony colour scheme. The black is ultra-cool and will no doubt be the one people go for. But when people saw the white one at the recent DJs For Life event, everyone loved it. I guess I'm on my own then in this respect. When you first walk up to the 08, despite the new styling, it's quite obviously a Vestax mixer. Care has clearly been taken to make sure everything is laid out logically, aesthetically and familiar - as the most likely purchaser for this mixer is a former 07 owner. From a build point of view, everything lives up to the professional name tag. 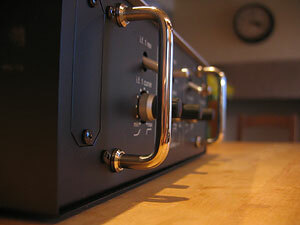 It's in the details as well like the knob protection bars at the front down to the industrial power supply connection. This unit feels like it'll be just as happy out on the road as it would in the bedroom. it's a bit of a challenge to the scratch brain. 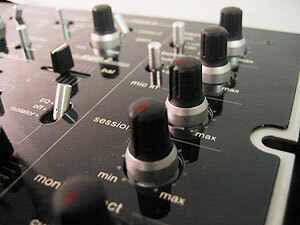 Usually, mixers are pretty formulaic with most knobs and buttons being where you'd expect them to be. But the 08 feels like it was designed for Michael Knight - this is the mixer equivalent of Knightrider's KITT car. It's left to right knobs, switch, buttons and lights. Sure the familiarity is retained with the 07 features but it's all the new stuff on top and round the back that really takes some getting used to. Before approaching this mixer, I recommend a cup of coffee and an hour with the manual to figure out what everything does. Expect a Dummies Guide™ to the 08 to come out soon. Let's break this down into it's constituent bits and bobs. Right now there's a revolution going on in the fader market. People just aren't happy with stock faders anymore and will find ways to either mod the fader or stick an outright replacement in there. Vestax have obviously seen the amount of credit card and scrape mods happening on their VCAs and have a whole new digitally controlled crossfader in place. Some of you may have seen the new CF-CC faders coming out from Vestax with the 2 lag adjustment wheels on top of the fader - seems this is almost the same fader as that but the adjustment is done on the front face of the mixer with little dials - just like the Ecler HAK 360 before it. The adjustment works for both sides so you can tailor the lag to suit your own style. It's also infinite so that you can adjust the lag to tiny amounts. That said the smallest I can get from it is just a tad under 1mm which should be small enough for anyone. The line faders are based on this 04VCA tagged crossfader - called the 03, they seem to be almost identical to the 04 but with a slightly different circuit board. These do however still have the familiar 4mm lag that will need modding to get the best out of them. Thankfully Vestax have returned to form in the reverses and curves department. The crossfader at it's sharpest has no discernable curve at all - it's a real on/off thing. If you don't like such harsh curves, the adjustment to soften it is perfect - you really can get the curve just how you want it. 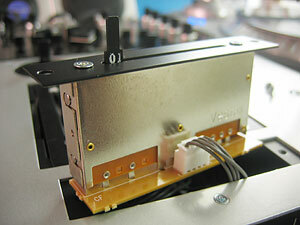 Thankfully, Vestax have listened to people and reinstated the reverses that were missing in the 007. The curve is nice as well - like the crossfader, it's pin sharp at it's tightest and can adjust to a 75% silent/25% linear curve at the other end. On a related note is the transformer switch. Usually, this would be a line/phono switch but now it's become a proper functional switch in it's own right. 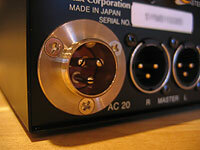 And as well as being rotatable under the faceplate, it's also pop-free - something that often plagues other mixers. Sound quality is something that Vestax have taken very seriously with the 08. Pitching the company at the professional audio end of the DJ market means that they have to deliver in this area big time. Moving the manufacture back to Japan means greater care is taken with every aspect and this is clearly evident in the 08. Their last venture into the digital mixer arena was with the ill-fated Samurai series. This new fader allowed digital on/offs on the fader, but found little favour with the scratch fraternity. The other side effect of this mixer was the pretty horrible metallic sound quality. Thankfully however that is a thing of the past as the sound quality from the 08 is a world away from the Samurais and frankly many other mixers on the market. As previously mentioned, the DSP allows Vestax to get clever with the sound. Thanks to the DSP, the 08 has 2 modes - EQ and isolator. 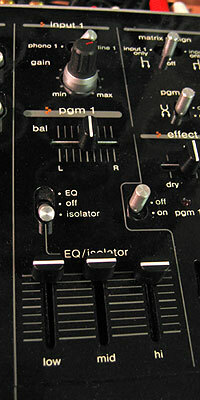 Isolator on the face of it operates pretty much like most other mixers, offering a regular amount of headroom but full kills. (+6db to infinity - pretty standard) but under the hood Vestax have tried to give the 08 a distict sound. Now at the flick of a switch, EQ mode offers a wider range (+12db) at the top end while still taking it pretty low (-24db) at the bottom end. And it does it extremely well too. The isolator is adequate and you won't have any issues with it but when you switch to normal EQ, the sound really does come alive, making the isolator sound utterly flat in comparison. I know we all like to kill the bass to stop rumble from the deck while scratching but I'm happy to live with the smallest amount if I can get vibrant sound. 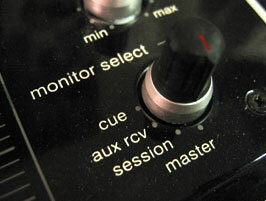 Bucking the trend for knob EQs, Vestax have stuck with the small faders - another nod towards its heritage. And they have a nice reassuring click in the middle as well so you know where you are. And yes - there are pan faders as well. This years must have is effects. Any scratch mixer worth it's salt has at least got an fx loop but increasingly fx are being built in as witnessed in the older Pioneer 909 and the brand new Urei 1601E and AudioInnovate's AEM-100. Continuing Vestax's 2 for 1 theme, the 08 comes equipped with 2 complete send and receive loops. Effect loop 1 is like many others on the market - both outputs are sent to the external effects unit, the volume level of receive being controlled by the wet/dry fader - dry is the original sound, wet is the effect received. You can also decide if channels 1, 2 or both get sent. This is as basic as it gets and is generally found on most mixers with such a loop. Thankfully this loop is post fader, meaning effects such as echo don't get clipped as you close the fader. 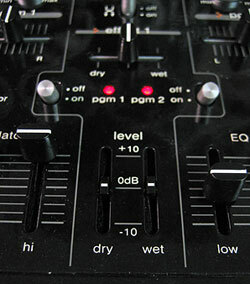 And you can also adjust the volume of the send and receive as well with the faders to -10db and +10db. One small black mark in an otherwise unblemished copybook so far - the wet/dry fader is plastic (the same as the EQ faders as well). I found myself worrying that while doing some fancy 1 channel beat juggling with the effects, smacking the wet/dry fader back and forth might not exactly extend it's life. Might be an idea to change that in the future. But for Vestax, this isn't enough. They had to go one better. Loop 2 gives you amazing control over both channels. Usually, as with loop 1, you'd only get to decide if you were going to send channel 1, 2 or both. 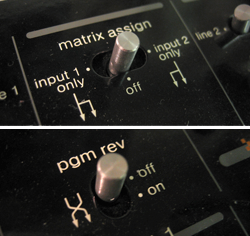 In some mixers you get a faceplate-off option to flick a switch to determine pre or post fader sending. This 2nd loop has all bases covered and then some. You can determine pre, post or off for each channel and control how much of each channel is sent through the loop. And as if this wasn't enough, you can also set the receive level as well as the EQ, albeit on both channels rather than individually but it's a level of control unheard of on any other scratch mixer before. Now while you all say you don't need effects, this will be the next phase in the development of scratch music. I've never been a big effects fan as I've never had much desire to add this next level to my repertoire. But having linked this to a Pioneer EFX-500 and thrown my usual scratchy noises through delays, echos (great for making multi-layer loops) plus all the other effects available, I have to say I'm pretty converted. The simple act of adding a bit of a delay to a slowed down dirty beat makes a world of difference. And having such a heavily spec'd send and receive like this one found on the 08 gives you all the options you'll ever need. Even if it had just got this second loop, it would still be a long way ahead of every other scratch mixer out there. And I feel like I've only scratched the surface (sorry for that) of what can be achieved. A whole heap of brownie points for Vestax for this. And there's one last cherry on the cake - each of the fx loops has a switches on the back to adjust the level of the signal both to and from the effects unit depending the the devices you've got attached. Not all line level signals are equal so this compensates accordingly. All sorts of effects pedals are available and all kinds of prices so you could buy a cheap and dirty guitar pedal and use it with th 08 that's to the switachable input impedances. Continuing the theme of familiarity with the 07, the crossfader monitor and level faders remain much the same. But it's in the selector that we see a real advancement for Vestax. Normally, you can expect to see a master and cue toggle to allow you to switch between the 2 but with all these extra inputs and outputs, Vestax have added a couple of extras to this switch. You can now monitor what's happening in the send and receive loops as well as the session input. So now you check out the effect in the loop before applying it to the channel. Things are a little different in this department as well. And I like the layout of this as well - all logically down the right hand side. Interestingly, these controls are now knobs rather than faders. 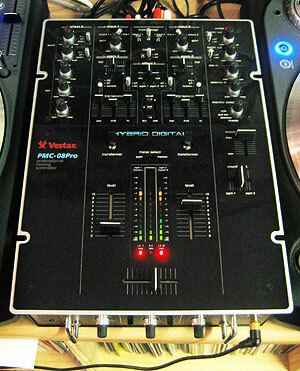 I'm a little confused as to why Vestax didn't use knobs for all the controls on the right hand side. Anyway, firstly we have the master volume level and right below it the booth output level as well - something that the 07 didn't have. In addition, each of these controls has a mute switch. This is especially handy for when you've got the levels just right but need to kill the output for whatever reason. Below these is the microphone volume. This is interesting for me as I often wonder why scratch mixers have really elaborate mic sections. On the 07, you were pretty much covered for all things mic with 2 mic levels, eqs and pans. Now all that's left is a volume control - the rest of the space gas been taken up for way more useful functions. It's a clear indicator that the 08 is unashamedly a scratch mixer and nothing else. Lastly is the session in volume which really needs no explanation. The one thing that strikes me about the 08 is the sheer amount of controls over volume, effects and EQ. Not only do you have EQ on the 2nd effects loop, but using something like the EFX-500 you also get EQ controls on there as well. It strikes me that there's no possible way that you can't get the sound that you want with the 08 - everything has been thought of and addressed. I'm told that Vestax enlisted some of the finest sound people in Japan to consult on the 08 and it shows. I think almost everything has been covered so let's just clear up a couple of loose ends. First up is matrix assign. This is a nifty addition that I've not seen on any other mixer. Basically it allows you to route both channel inputs to one channel. Confused? I was. Here's the breakdown - with the switch in the middle, everything works as you would expect it to. Move it to "input 1 only" and channel 1 is routed through both channels, taking on the volume, EQ and FX routing of that channel. So panning the crossfader switches between channel 1 only but the audio levels are as if it was channel 2. Thus you can get some cool tricks with different EQ's on each channel but crossfading between the 2. And there's a program reverse switch as well. This is a complete switch where everything gets swapped over - EQs, volume and everything. 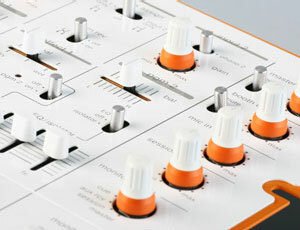 As you'd expect from such a highly spec'd mixer, the inputs and outputs aren't overlooked either. And it's fair to say that the similarity with the 07 ends here. It's all change in this department. Obviously there's phono and line ins for each channel (switchable on the top) but each line input also has a toggle to cater for differing line levels between -10db, 0db and +4db. And I'm led to believe that the ruggedness of the RCAs has been improved as well. The ground connection has been changed - you only have one instead of two but it looks to have been beefed up a little as well. The session remains the same but it's the outputs that get a serious overhaul. In line with the pro audio image, the 08 now has balanced XLR outputs - no self respecting company serious about their mixers can do anything else these days. You still get unbalanced master output but via RCA instead of jacks and as a double bonus you not only get booth output but also a sub-master as well. This has the same output as the master but now you have an extra output to record from. Just take a look at this - the power supply has been uprated to one hell of a block - the same as Vestax's installation mixers. And the connector has been upgraded equally. This beauty screws in and stays put no matter what. The power supply needed to be updated because of the DSP - it needs a a lot of power to deliver the performance required. The slight downside is that it's quite a beast to lug around. And finishing off, you've got the 2 send and receive loops. All in all, the 08 has packed in a serious amount of ins and out's into the back of a normal sized mixer and have taken it into a new realm of professional audio. Anyone seen the port on the side of the Pioneer 707 and 909? We all thought it would be for some super new plug in toy but seemingly it was for rather boring techy diagnostic stuff. So imagine how intrigued I was when I saw this panel on the front of the 08. Of course, being the hard hitting investigative scratch journo that I am, I took a screwdriver to it. And inside I found... nothing. But fear not - it's there for a good reason and that reason is expansion. Coming up with a worthy successor to the ubiquitous PMC-07 was always going to be hard. Finding the balance of pleasing existing owners yet moving the product forward is tough but Vestax have pulled it off brilliantly. They've clearly looked at the direction of the scene as well as the current needs of DJs and come up with a mixer that is amazing now and will be amazing in the future as well. The 08 isn't for everyone though. If you're just after a 2 channel scratch mixer, you can get one that'll do the job for half the price. The 08 however is geared much more toward the experienced DJ who plays out and tours, and probably works in the studio as well. And also on a battle mixer level, I'm sure some pretty neat tricks can be pulled off with the matrix and EQs as well. Watch out DMC! After having played with the 08 for around 3 weeks now - every day often for hours at a time, I now find myself hankering for one of my own and an effects unit as well (because that's when it shows it's worth). While it lacks some of the specialised bells and whistles that other mixers have, what it does do is address the growing needs of the scratch DJ and executes them with a quality and style that I've not seen before. Granted it's not cheap or indeed an easy mixer to get to grips with but once you sit down and read the manual, the 08 delivers on all levels and is the true successor to the 07.